Haters are going to hate. That much is true when it comes to QR codes. There are a lot of things going around about QR codes that are simply not true and not based on any accurate observation. 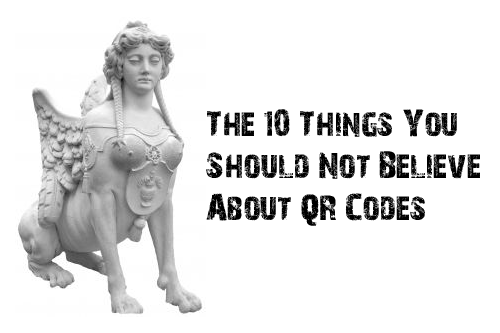 AzonMobile thinks that it is best for people to know the truth about QR codes. The truth is, people are scanning them and they are not going to lose out to newer technology. Your customers are now very familiar with QR codes, and given the right incentive, they will spend time taking out their smartphones and scanning the QR codes you have posted in your store, on marketing materials, on your business cards, or anywhere else you place them. What else are people saying wrongly about QR codes? 3. A QR code can easily be damaged. Some critics say that marketers and other people should be wary about using QR codes because it is easily damaged, thus rendering it un-scannable. That is not entirely true. Remember that QR codes have a 30% error correction in them. This means that you can take away or obscure up to 30% of the QR code and you will still be able to scan it with no problems. What's more, you can opt for a higher error correction when you generate your QR code if you want to be doubly sure that it is scannable even if somebody had tried to deface it. 4. Black and white. QR codes are ugly. We really cannot blame why some people think that QR codes are ugly when most of them have only seen a black and white QR code. However, if you really want to make your QR codes eye catching and attractive, you can opt to use a customized QR code. However, aesthetics is not the only reason why you should use a customized QR code. There are other benefits such as making sure you stick to your branding, assuring your customers that the QR code is really yours, as well as catching their attention.